Fighting Crime; formerly Vengeance for the death of Hamato Yoshi. 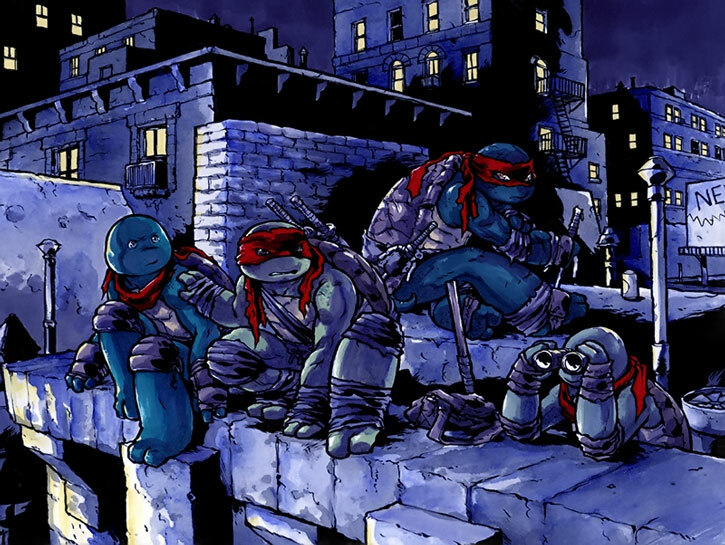 The Turtles generally patrol the streets of New York training, and dealing with petty crimes when they stumble across them. Whatever April can provide, or what they can acquire from their misadventures. While Splinter guides and mentors the Turtles, Leonardo is their de-facto leader in the field. Over the years, Splinter has amassed a small arsenal of ancient Japanese weaponry. 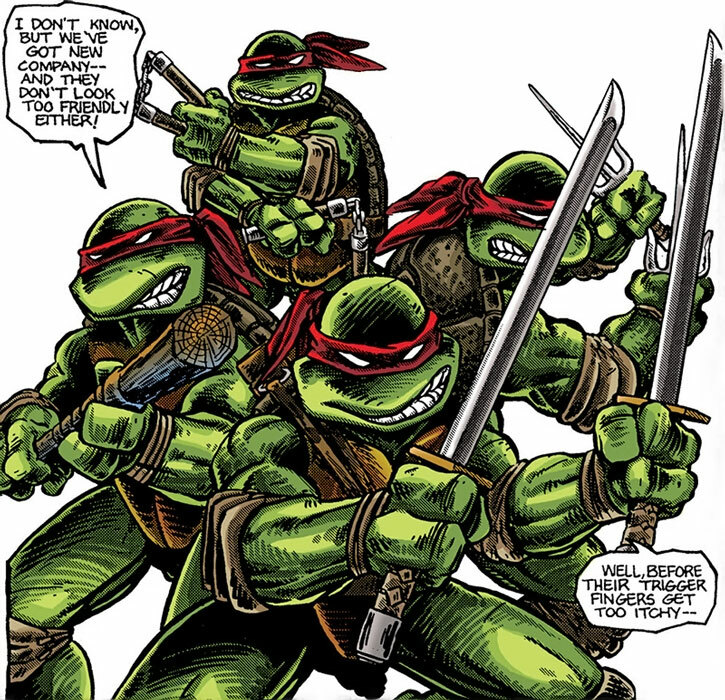 While the turtles clearly have preferences in the weapons that they wield they have access to virtually any single piece of ninja weaponry, from katanas to manriki-gusari. Generic ninja melee weapons [BODY 04, EV 04] – usually a sword, but might be a pair of kama (hand sickles), a one-metre long weighted chain, a pair of sai, a pair of butterfly swords, etc. The Turtles story doesn’t actually start with the shell-backed heroes, instead it starts 20 years in the past with their master Splinter. At that time, Splinter was the pet one of the Foot Clan’s greatest ninja assassins; Hamato Yoshi. Even back then, it was apparent that there was something different about Splinter. From day to day, he watched Yoshi practice his ninjutsu and from his cage learned to mimic Yoshi’s movements. Over time, Splinter stopped mimicking Yoshi’s movements and mastered the Foot Clan’s mysterious martial art of ninjutsu. Even stranger, the brilliant rodent somehow absorbed the concept of bushido , and grew to love Yoshi in the same manner that a Samurai warrior loved his Lord. Yoshi fell out of favour with the Foot Clan when he murdered one of his clan brothers, Oroku Nagi. The event occurred when Yoshi walked in on Nagi assaulting his lover, Tang Shen. In a fit of rage, Yoshi beat Nagi to death with his bare hands. Rather than taking his own life, as was demanded by Clan law, Yoshi fled with Tang Shen to America in the hopes of starting over. The two settled in New York, where he started a small martial arts dojo and lived a quiet life. This life was not to last as Nagi’s younger brother, Oroku Saki, swore vengeance back in Japan and spent the next seven years training in preparation for his confrontation with Yoshi. By the time he achieved his eighteenth year, Saki was the deadliest member of the clan and was given the opportunity to start a New York branch of the Foot Clan. He spent the next year building the New York clan. The assassins quickly muscled out most of their competition and became the fiercest organized crime group in the city. When the Clan reached its apex of power, Saki tracked down Yoshi in his small New York apartment and murdered Tang Shen and him. During the struggle Splinter’s cage was smashed, and he escaped into the New York alleyways. One day while he was scrounging for food, Splinter witnessed a young man save a blind old man from being struck by a truck. While screeching to a halt, the truck jettisoned a metal canister that struck the young man near his eyes, bounced into the street and shattered a glass bowl that was being held by a young boy. The bowl had held a group of 4 young turtles that fell into an open manhole, and landed in the puddle of glowing liquid that the metal canister once held. Splinter followed the 4 helpless turtles into the sewers, and after cleaning the glowing goo off of them, gathered them up into an abandoned can for their own safety. To Splinter’s shock, over the next few weeks, the turtles grew at a startling rate. They doubled in size again and again and eventually began to walk upright and speak. Splinter grew too; his body began to mutate and his intelligence grew even faster. When his wards began to imitate his movements, the seed of a plan began to germinate in Splinter’s mind. He began to train them and taught them everything he had ever learned from watching Yoshi. Before he knew it their level of skill had surpassed his own. 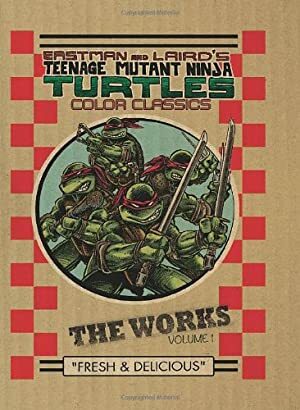 Using a battered book of Renaissance art he had recovered from a sewer drain, Splinter gave each of the 4 a name; Leonardo, Michelangelo, Donatello and Raphael. With their training complete, Splinter had one final request for his “sons”; he asked them to take vengeance for Yoshi, Tang Shen, and himself. He asked them to murder the Shredder. 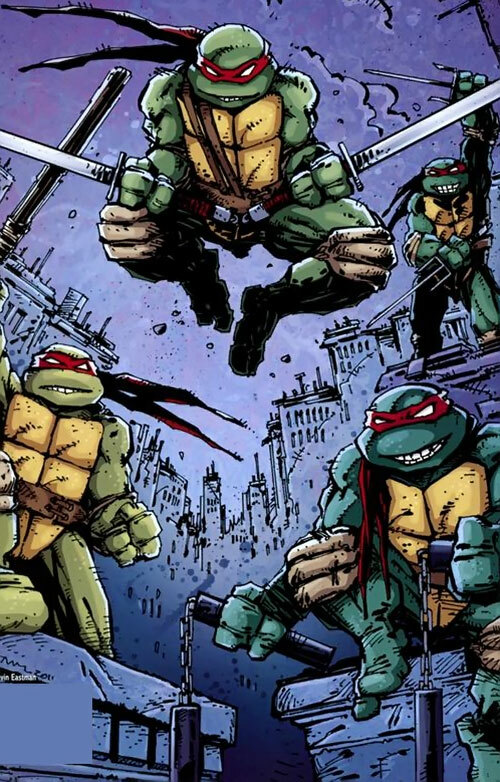 After proving that they were capable of defeating the Foot (by massacring a rival gang, the Purple Dragons), the Turtles set out on their path of vengeance. Raphael delivered a challenge to a duel to the Shredder himself and the four turtles awaited until the appointed time and journeyed to the roof top where their confrontation would take place. Saki, predictably, did not arrive alone and unleashed the full force of the Foot Ninja on the 4 turtle brothers. The battle was violent and fierce, but in the end the 4 Turtles stood victorious. Left with no other choice, Saki (now known as the Shredder) faced each turtle in turn. Initially he easily turned back the attacks of Michelangelo, Donatello and Raphael. Only Leonardo managed to wound him. 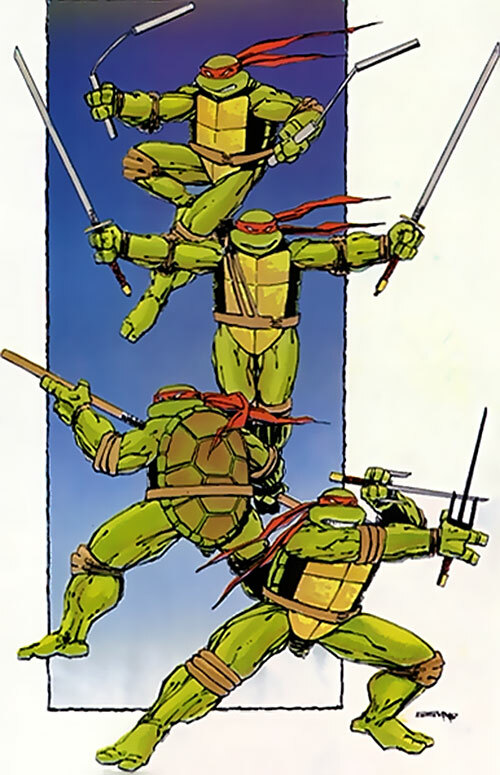 Realizing that Saki was simply too much for any of them to fight one on one, Leonardo and his brothers attacked the Shredder as one and using group tactics eventually scored a fatal blow. Rather than facing the disgrace of defeat, Shredder Saki attempted to murder all present on the rooftop with a thermite grenade but Donatello sent him hurtling from the roof with a well placed strike of his bo. The grenade exploded and when the brothers found nothing but a shred of Saki’s armour, they assumed him dead. With their mission a success, the Turtles returned to their underground layer and basked in Splinter’s approval. With their need for vengeance sated, the turtles settled into a comfortable pattern or eating, training and patrolling the streets of New York. Several weeks passed before the Turtles encountered a young woman fleeing desperately through the storm drains under the streets from several robotic pursuers. Curious (and unwilling to stand by and watch the woman be killed), the turtles easily smashed the robots and took the her back to their lair. When she regained consciousness (she had fainted at the turtles appearance), she introduced herself as April O’Neil and told the turtles (and Splinter) that the robots were Mousers designed by Baxter Stockman. Though the Mousers were originally intended to solve New York’s rodent problem, he intended to use them to hold the city hostage by using them to weaken the support structures of key building structures in New York. April had discovered his plan and in turn he tried to have his creations murder her. Unwilling to allow Baxter to harm innocents, the Turtles and April invaded Stockgen in the attempt to halt Baxter’s plan. In response, Baxter set his system on self-destruct and re-called his Mousers to his lair. The Mousers attacked the Turtles and all seemed lost until April and Donatello managed to hack Baxter’s system and remotely shut down the Mousers. After Baxter’s defeat, the Turtles (now dirty and exhausted) returned to the lair while April returned to her home. To their shock, the lair was in ruins. The remains of shattered Mousers were everywhere and Splinter was missing. Left with little choice and understanding that the authorities would most likely follow the trail of Mousers from Baxter’s building to the lair, the Turtles abandoned their home. Realizing that they had no place to go, the Turtles called the only friend they had – April. Eternally grateful to her new friends, April immediately picked the Turtles up and welcomed them into her apartment. The Turtles spent the next week attempting to adjust to their new reality. Though they loved the freedom of being out of the sewers, the loss of Splinter weighed heavily upon them. Still they attempted to move forward and continued to train and patrol the city. 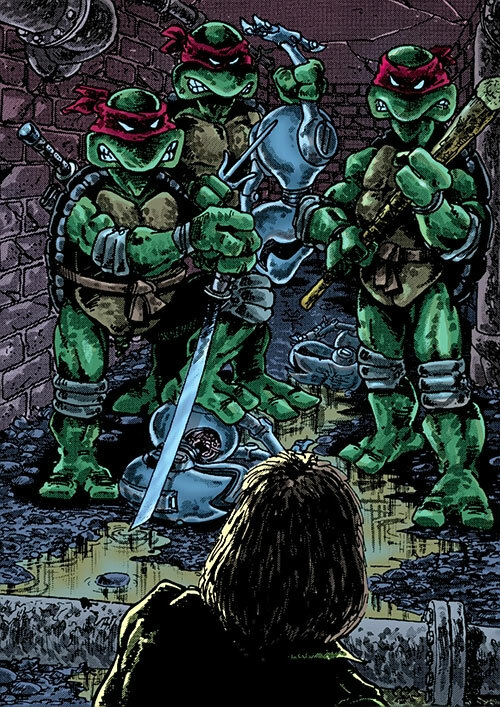 It was during this time that Raphael first encountered Casey Jones. On one particular patrol, they were set upon by the remnants of the Foot Clan. The 4 brothers fought valiantly and eventually defeated the rogue ninja assassins, but not before Michelangelo received a serious wound. As the battle wound down, the Turtles suddenly recognized the signage on a neighbouring building. The building’s markings spelled TCRI, the very same markings that were on the canister of goo that mutated them in the first place. Unable to contain their curiosity, the Turtles first returned to April’s apartment to bind their wounds and clean themselves up, and then returned to the TCRI building. With haste and skill that only a trained ninja (or master thief) could muster, the Turtles broke into the TCRI building and started to explore. They found nothing of interest, until they discovered Splinter hanging unconscious in a stasis field within a lab they had found in the building. Enraged and confused, the Turtles set about freeing their master when the found themselves quickly set upon by strange brain-like alien creatures piloting humanoid robotic bodies. Desperate and afraid, the Turtles fought back with all of the vigour and power they had at their disposal. Unfortunately for them, during the course of their frenzied battle they accidentally triggered a translocation device (teleportation device) and were instantly transported billions of light years away. When the turtles rematerialized, they found themselves in a dark alley way surrounded by soldiers. The soldiers were attempting to apprehend a robot who was huddled in the alley behind them. 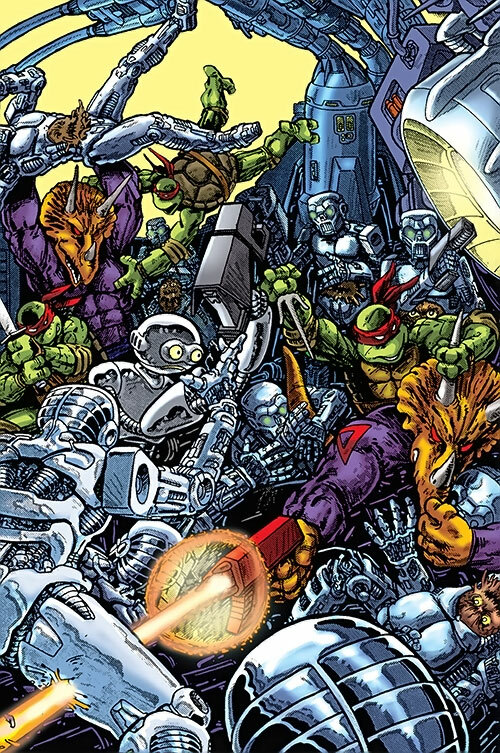 The turtles attacked and defeated the soldiers before they could decide what to do and escaped with the fugitive robot. The robot revealed that it was truly Professor Honeycutt, and that he was being hunted by the forces of the Federation. They wanted his teleportation technology that existed only in his head. Hoping to use this technology to get home, the Turtles decided to protect the Fugitoid. Ultimately they failed. While battling the Federation, the forces of the Triceraton empire kidnapped Honeycutt. As they made their escape, the Turtles stowed away on their ship. Unfortunately, they stowed away in a hold that was not oxygenated. Having no resort, they put themselves into a state of suspension animation and were promptly captured by the Triceratons when they landed. Rather than killing the Turtles, the Triceratons used them to try and coerce Honeycutt to cooperate. When that didn’t work, the Turtles were placed into the Triceratons’ gladiator games. Despite the Triceraton Gladiators’ strength and size advantage, the 4 Turtles training proved to be more than sufficient and allowed them to kill their opponents. As the crowd went crazy, the turtles commandeered a nearby flying video camera and assaulted the Triceraton leadership directly, accidentally killed their Prime Leader, and freed Honeycutt. Eventually, the Turtles and Honeycutt found themselves surrounded. As the Triceratons moved in, the Turtles and everyone immediately around them (including Honeycutt and several Triceraton soldiers were transported back to earth. When they rematerialized they found themselves surrounded by the TCRI aliens who tried to assure them that they meant no harm. The Triceratons, unwilling to believe that the TCRI aliens intentions were pure, tried to fight their way out. The Turtles joined forces with the TCRI aliens and brought the Triceratons down. With the immediate threat over, the TCRI aliens revealed that they had only been trying to defend themselves earlier and returned Splinter to his family (they had placed him in a healing coma when the turtles saw him earlier). Splinter explained to his sons that he had been wounded when Baxter’s mousers attacked the lair and had barely escaped when he was found by the TCRI aliens. The TCRI then explained their part in the Turtles origins. They had crashed on the earth over 20 years previous and while transporting equipment from their township to their newly acquired New York base, a canister filled with a mutagenic substance shook loose, thus starting the Turtles unusual journey. Unfortunately, the energy output from the Transmat beam was immense and had lit up the New York skyline, drawing the attention of both the NYPD and National Guard. The only bit of good news was that with the Transmat repaired, the TCRI could return home. As New York’s finest and the army invaded the TCRI building, the TCRI and Turtles beamed back to their homeward. Moments later, the building and it’s technology self-destructed to prevent the alien technology from falling into the wrong hands. Minutes later, the Turtles transported from the TCRI homeward back to April O’Neil’s apartment, who had been worried sick about the fate of her friends. The Turtles, Splinter and April spent the next few weeks leading up to Christmas settling into their new situation. The turtles trained and got into several misadventures. One night, while Leonardo was out on an exercise run, he found himself ambushed by dozens of Foot ninja. Despite his best effort, Leonardo was eventually brought low by the Foot, especially when the presumed dead Shredder joined the fray. Instead of killing Leonardo, the Foot dragged his wounded body back to April’s apartment and threw him through one of the windows as a message to the other Turtles. As the turtles reacted in disarray, the Foot attacked in force. Unfortunately for the Foot, the Turtles held their own long enough for their back-up to arrive; Casey Jones. 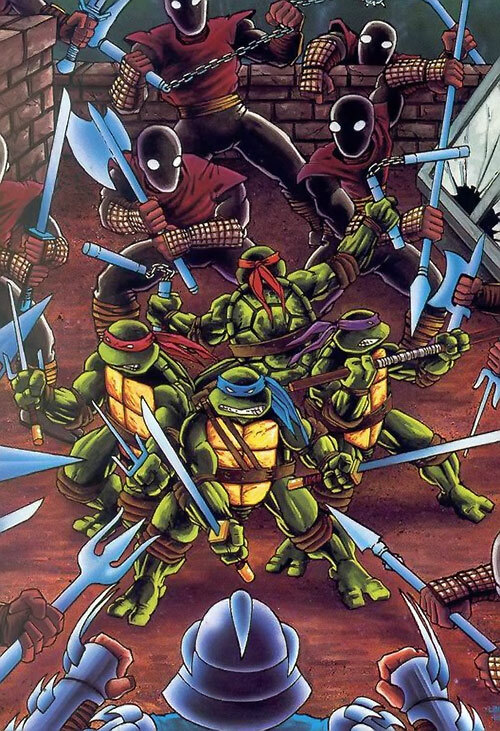 Casey’s appearance threw the Foot Ninja into just enough disarray for the Turtles to take control of the battle and escape April’s apartment (along with Splinter, April and Casey). They fled New York and ended up at Casey’s grandmother’s farm house in North Hampton. There they spent just under a year recovering from the wounds of the battle. For the first several months their confidence and trust in one another had been fractured by the Foot’s ambush. Leonardo’s faith in his skill was shattered, Michelangelo’s normally cheerful disposition had disappeared only to be replaced by cold focused anger, Donatello buried himself in the repairs that the farmhouse needed and writing while Raphael grew even scarier. Eventually, after winter had passed, Splinter decided that his sons had spent enough time grieving and restarted their training in earnest. He forced them to face their demons and recognize the personal cost they had brought into April’s life. A couple of months later, the Turtles had all seemingly recovered their focus and inner peace, except for Raphael. A year after the Turtles fled New York and arrived in North Hampton, Raphael had finally had enough. Their defeat at the Foot’s hands, and Shredder’s return ate at Raphael for the entire time his brothers convalesced in the North Hampton countryside. His anger and frustration grew over the year until it ultimately exploded in December. He insisted to his brothers that they return to New York and finish what they started. When the other’s said that Leo had needed the time to recover, Raphael dismissed their concerns and said that Leo was no longer fit to lead them. At that exact moment, Leonardo entered the room and the two got into a heated argument about returning to New York. When it became apparent that neither side would budge, Raphael simply decided to leave. Unfortunately, when Leonardo refused to let him go the argument turned into a fight. Leonardo did his best to stymie Raphael without hurting him badly, but Raphael fought to win. 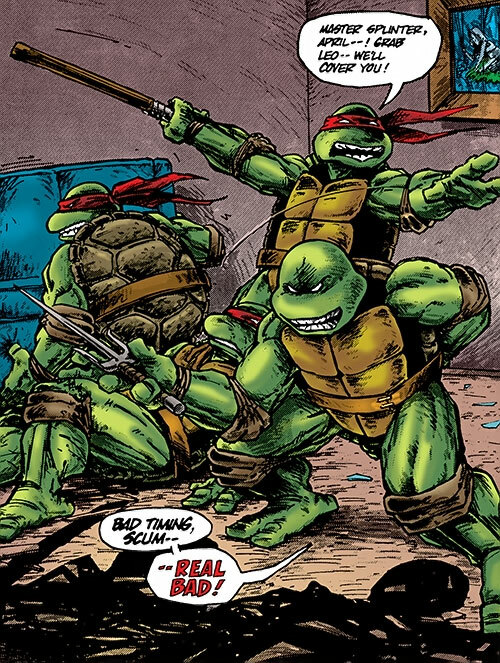 In short order, Raph beat Leonardo into unconsciousness and then left while Don and Mike tended to their brother. Days later, Raphael stalked the sewers of New York, searching for members of the Foot Clan. He had encountered and killed several of them when he stumbled across a lone Triceraton named Zog who had survived and been left behind when the TCRI aliens had abandoned the Earth. Upon seeing the half-mad Triceraton (due to the high oxygen levels of Earth), a spark of an idea came into Raphael’s head. He led Zog back to the Turtles’ former lair, and waited for the others to come. Raph knew that despite what happened, Leonardo and his brothers would not let him face the Foot alone. When they arrived, the four Turtles followed Raphael’s lead and followed Zog to one of the Foot’s control centres. Using information from the centre, they located the Foot’s New York headquarters where they correctly surmised Oroku Saki would be located. The four Turtles and Zog stealthily infiltrated the Foot’s lair, but the mad Triceraton soon initiated a full scale frontal assault against the deadly ninjas. While the run of the mill Foot ninjas fell quickly before the Turtles and Zog, they eventually encountered some of the Foot’s mutated warriors who killed Zog and stymied the Turtles advance. Raphael ran ahead of his brothers while they battled the mutant Foot ninjas, eager to face Oroku Saki on his own. His almost rabid rage dulled his senses enough to allow four of the Shredder’s elite warriors to ambush him and to quickly render him helpless. Only Leonardo’s sudden appearance (he had followed Raphael as soon as he defeated his own opponent) spared Raphael’s life. Leonardo took the guards by surprise and slew them all before they could finish Raphael off. Chagrined and ashamed, Raphael admitted his error and told Leonardo that the Shredder was his. While Leonardo charged forward, Raphael turned back to help the brother’s he had abandoned earlier. 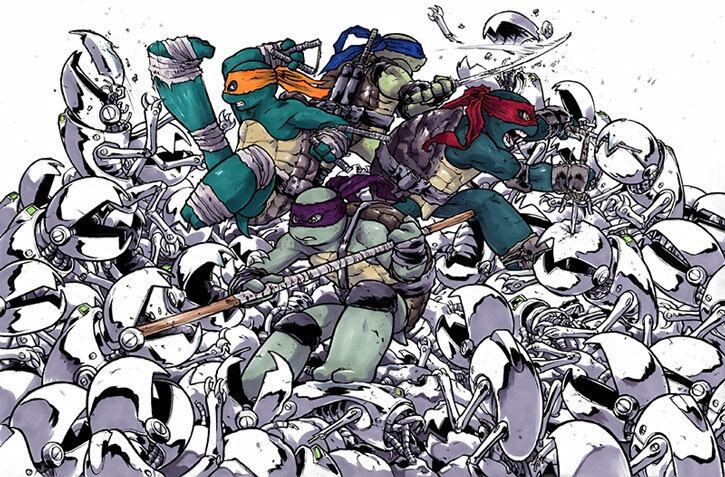 Raphael returned to find Don and Mike surrounded by Foot ninjas. Using a nearby modified forklift, Raph scattered the Foot and allowed Michelangelo the opportunity to steal one of their rocket launchers. Mikey fired a rocket in error and caused a massive flood in the complex which washed the enemy ninjas away and damaged the buildings’ structure. Meanwhile, Leonardo had found the Shredder and engaged him in single combat. The resurrected ninja master proved to be as skilled as ever and despite Leonardo’s vigour, gained the upper hand. He was about to deal Leonardo a killing blow when the structural damage caused by Michelangelo’s impromptu flood caused the rooftop they were fighting on to shatter and buckle. Leonardo used the distraction to regain his footing and weapon and charged at the Shredder for one final pass. The two warrior met in mid-flight, blades flashing. But Leonardo’s was the only one that struck true; with that single strike he decapitated his deadly foe. The structural damage to the building eventually proved to be too much, and the building crumbled as explosions rocked the block. The four Turtles each managed to escape the conflagration safely and made their way back to the underground lair. There, Leonardo presented the corpse of Saki to his brothers. With proof of Saki’s demise the brothers (Raphael) finally had the closure they needed. After burning Saki’s body on the New York river, the Turtles returned to North Hampton and their waiting friends. Writeup completed on the 9th of September, 2014.